When I say this I don't mean to say I'm doing it through my own strength. It's never been my strength. We all have a need for a support system, whether it's our immediate family--brothers, sisters, parents--or even the family we have with our spouses and children. Relationships are the glue which hold us together. I say all of that to say this, Donna Gibbs has tremendous insight as to how to become resilient. 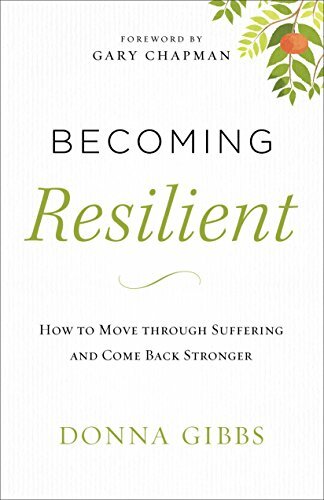 She shows, in her book, how to go from suffering to getting unstuck, to thriving even when you do suffer. Again, Jesus tells us, "Do not fear what you are about to suffer. Look, the devil is about to throw some of you into prison to test you, and you will suffer tribulation for ten days. Be faithful even unto death, and I will give you the crown of life" (Revelation 2:10, Berean Study). Overcoming this life, the struggles we go through, the pain and suffering we have isn't simply something we go through on our own. Jesus has been there. Donna shows and reminds us, in her way, that Jesus was just as resilient as we can be. If anything, Jesus is the model of how we can stay and remain resilient. We all need help, so we ought to let God do His part, while we do ours: lean on one in another when we need to grieve (see Galatians 6:2). I received this book free from Revell Publishers in exchange for my honest opinion of this book.